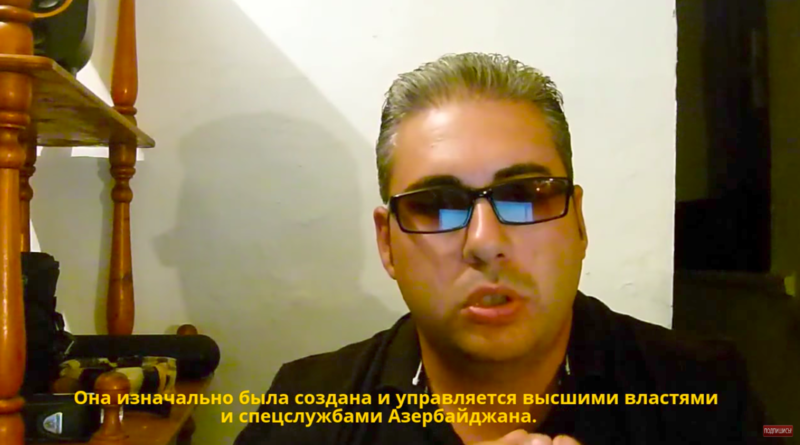 Vahan Martirosyan, one of the founders of the Armenia-Azerbaijan Peace Platform, in a YouTube video in which he denounces the organization as an Azerbaijani government sham. One of the founders of the Armenia-Azerbaijan Peace Platform, a Baku-backed initiative ostensibly aiming to bring the peoples of the two warring countries together, has denounced the organization as a sham organized by the Azerbaijani government. "This so-called peace platform has no connection to the Azerbaijani people and society," said Vahan Martirosyan in an online video published on May 27. "From the beginning, it was created and managed by the Azerbaijan government and security services." Martirosyan was one of the three Armenian founders of the platform, which was set up late last year. The endeavor was particularly notable for the fact that it brought several Armenian activists to Azerbaijan, a country that typically denies a visa to anyone whose name ends in -yan. That the Platform was a thinly veiled publicity stunt on the part of the Azerbaijani government was never in doubt. The Armenians involved were fringe figures, and espoused views far out of the mainstream of Armenian public opinion. But the public denunciation of the platform by one of its founders nevertheless comes as an embarrassing blow to Baku, which had promoted the group as evidence that it -- in contrast with Yerevan -- was genuinely interested in the friendship of peoples. The Platform released a statement following the video's release, saying that it was the result of "pressure from those who don't want peace between Armenia and Azerbaijan and continue the policy of occupation," an apparent reference to the status of Nagorno Karabakh, a de jure part of Azerbaijan that is de facto controlled by Armenian forces. Eynulla Fatullayev, the editor in chief of haqqin.az, an Azerbaijani pro-government news website that employed some Armenians connected with the Peace Platform, posted on facebook: "The most important thing is that in the information war, we're taking maximum advantage of these Armenians. Now we no longer need him [Martirosyan]. We'll use new ones and then throw them away. We never forgot that for us, the Armenian is an enemy." A few hours later Fatullayev removed the post, however, and said that it was a "fake." Martirosyan's statement was indeed curious, and somewhat hard to take entirely at face value. He claims to have "genuinely believed that by means of this [platform] we could establish peace between the two peoples," he said in the video. "However I and several other Armenians, having seen Baku's dirty inner workings, quickly became convinced that the real goal of this project and all of the policies of so-called tolerance was and is only to hide the true face of aggression and totalitarianism." Whatever the case, it's not too hard to see this as the beginning of the end of the ill-fated platform.